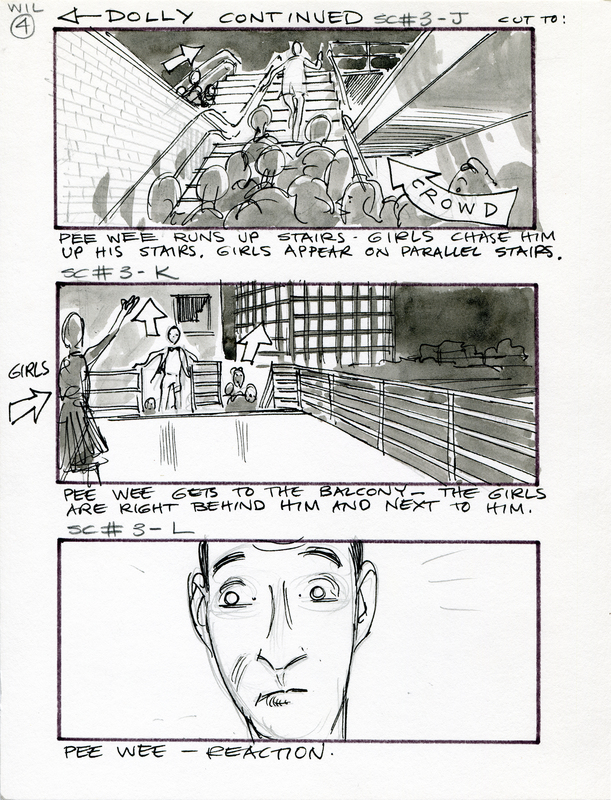 Original storyboard art by Carlos Aldana (aka Carl Aldana) for "Big Top Pee-wee" (Paramount Pictures 1988). Pencil, ink and watercolor on heavy paper/card stock, 8½x11 inches. It's a double-whammy for SCVHistory. The title character is played by a local college graduate, and the film was shot at multiple Santa Clarita Valley locations. "Big Top Pee-wee" is written and co-produced by its star, Paul Reubens (born Paul Rubenfeld, August 27, 1952), who attended Calfornia Institute of the Arts in Valencia in the early 1970s and came away with a bachelor of fine arts degree in theatre. Released July 22, 1988, as a sequel to 1985's "Pee-wee's Big Adventure," "Big Top Pee-wee" was shot in part at Disney's Golden Oak Ranch in Placerita Canyon, and also at the Hart High School auditorium. Storyboard artist Carl Aldana is listed as a set designer on the film. Aldana was born in 1938 in Guatemala City, Guatemala, and emigrated with his mother in 1944 to Vallejo, Calif., which he has described as "a small, blue collar town full of Navy war workers." "We had just come from a brightly colored provincial civilization to an energetic up-to-the minute culture, engaged in a world-wide-war and covered with soot from the effort," he writes. That clash of hues — the "Technicolored Central American country" of his birth, versus the subdued tones of an adopted country emerging from war — "has been the basis for much of my work, either exaggerating the color or understating it." It continues to influence the fine art he produces in the second decade of the 21st century. LW2557a: 19200 dpi jpeg from original artwork purchased 2013 by Leon Worden from an agent for the artist.